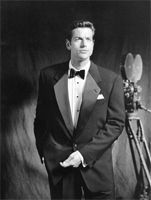 The poly/wool tuxedo from is equivalent in style to our 100% Wool Single Breasted Notch or Double Breasted Peak tuxedos, except that it is made from our wrinkle resistant poly/wool blend in place of all wool. Single Breasted Notch: Because single breasted tuxedos are often worn open, it is recommended that one accessorize their tuxedo with either a cummerbund or a vest. They can be worn with either a regular tuxedo shirt (either Wing collar or Laydown collar) with a bow tie to match the cummerbund or vest, or with a mandarin front tuxedo shirt with a button cover in place of the tie.